Brian McDonnell said lower outflows from corporate DC plans is also helping the growth rate relative to DB. Assets of defined benefit plans among the P&I 1,000 rose 7.9% to $6.597 trillion while defined contribution plans rose 13.9% to $3.729 trillion. Among the 200 largest retirement plans, assets totaled $7.452 trillion as of Sept. 30, up 9.7% from the previous year. DB plans in the top 200 reached $5.218 trillion, up 8% from a year earlier and DC plan assets totaled $2.234 trillion, up 13.9% from the year before. Within the 10 largest, the Federal Thrift Savings Plan, Washington, broke through the $500 billion barrier. The giant defined contribution plan for federal employees reported $531.49 billion in assets as of Sept. 30, a gain of 9.5%. TSP, which was created in 1986, is 57.8% larger than second place California Public Employees' Retirement System. The Thrift Savings Plan now accounts for 5.1% of the P&I 1,000 universe's total plan assets. The average increase of the 200 largest retirement systems in the year ended Sept. 30 was 12%. Strong public equity returns helped. As of Sept. 30, the MSCI Emerging Markets index returned 22.46%, the MSCI EAFE index returned 19.1% and the Russell 3000 index returned 18.71%. Among the P&I 1,000 survey's findings, the continued popularity of passive investing was clear. Passive indexed equity assets of defined benefit funds among the 200 largest plans rose 18.2% to $926.2 billion, and passive indexed bonds rose 56.6% to $142.5 billion. "We are seeing that over the last ​ couple of years, the big push to passive obviously," said John Delaney, Philadelphia-based portfolio manager and senior investment consultant at Willis Towers Watson PLC. "Obviously, active management has a tough time keeping up with the bull market, when there's a kind of beta rally like we've seen it's kind of tough for active managers to keep up." Added Russell Ivinjack, senior partner at Aon Hewitt Investment Consulting Inc. in Chicago: "I think the trend toward the additional assets invested in passive equities will continue. It has been harder to find alpha, particularly in the U.S. equity marketplace, (and) folks are fee sensitive. Those are two major trends there. "But if you (take) a step back and look at the totality of their portfolios, while they're increasing their passive equities, with the additional assets to private markets, whether it's private equity, real estate (or) real assets, those increased allocations in that area, they're truly availing themselves of the most active management," Mr. Ivinjack said. Among DB plans in the top 200, assets reported in private equity totaled $331.7 billion as of Sept. 30, up 10.4% from the previous year, and real estate totaled $315.8 billion, up 6% from the previous year. The aggregate defined benefit plan asset mix of plans in the top 200, meanwhile, reflects corporate plans' move away from equities because of derisking and public plans' addition of alternatives at the expense of equities and fixed income. As of Sept. 30, despite the strong market returns, the aggregate allocation to domestic equities among the Top 200 DB plans fell to 24.8% from 26.2% a year earlier. The change is even more stark when looking back 10 years. As of Sept. 30, 2007, the aggregate allocation to domestic equity among DB plans in the top 200 was 39.9%. Other significant changes in the past 10 years among the top 200 includes the near-doubling of allocations to private equity and real estate, which had aggregate allocations of 8% and 7.5%, respectively, as of Sept. 30. Ten years ago, the aggregate allocations to those classes were 5.1% and 4.8%, respectively. The dip in domestic equity in the most recent survey was countered by slight increases in international and global equity, which had aggregate allocations of 18.1% and 6.2%, respectively, up from 17.5% and 4.6% the year before. Other allocations within the aggregate mix showed little change. Meanwhile, the growth of corporate DC plans continued unabated, clearly emerging as the primary retirement plan for U.S. private-sector employers. Among the 200 largest retirement systems, corporate DC plan assets totaled $1.36 trillion as of Sept. 30, 18.3% of the top 200 plan assets. Corporate DB plan assets totaled $1.245 trillion, or 16.7% of the total. Just 10 years ago, corporate DB plan assets — accounting for 20.7% of the top 200 assets — eclipsed those of corporate DC plans, at 14.3%. 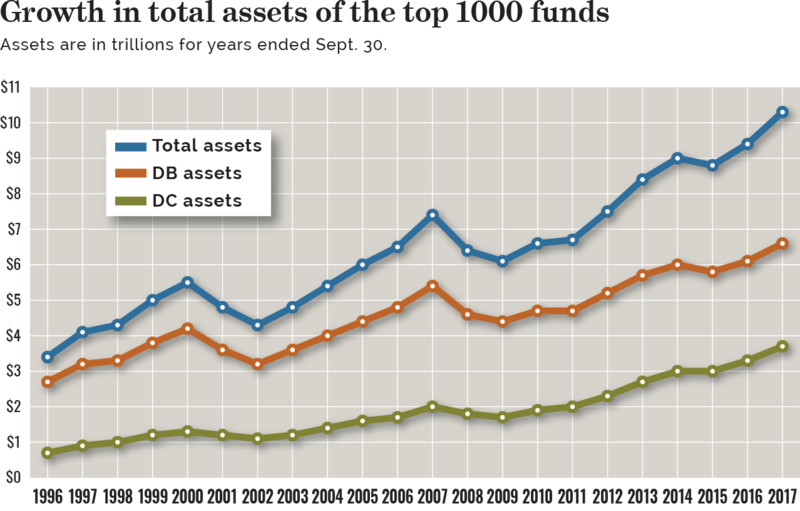 Overall, DC assets accounted for 36.1% of the P&I 1,000 total, up from 34.9% the year prior. Within the 2oo plans, DC assets accounted for 30% of the total, up from 28.9%. The growth rate of corporate DC plans over the past 10 years has exceeded that of public defined benefit plans, most of which — in contrast to their corporate brethren — are still open to current employees and future hires. "An order of 10% of employees have a DB plan nationwide, and obviously the preponderance of those now would be in public funds," said Jay V. Kloepfer, executive vice president and director of capital markets research at Callan LLC, San Francisco. Mr. Kloepfer said the faster pace of growth in DC assets compared even to public DB plans likely comes from contributions over the past decade. "DC plans clearly are how people are saving for retirement," Mr. Kloepfer said. "The growth is clearly in assets. People are setting aside between 2% and 10% every year and some employers match." Brian McDonnell, global head of pension practice at Cambridge Associates LLC in Boston, also added that outflows are lower among corporate DC plans than in public DB plans. "If you're looking at the asset growth as the metric, I would think about both inflows and outflows," Mr. McDonnell said. "If the average age of participants in the DB plan is older than the average age of the person in a corporate DC plan, if you think about that, most people who are participants in DC plans are still in the asset accumulation phase of their retirement. They're not taking any money out of it." "Public DB plans have been around for 50, 75 years," he said. "You have a big chunk (of participants) who are taking money out as well. It's asset growth really being a net number." Public pension plans, however, remain open to current employees and new hires for the most part. On the corporate side, where most defined benefit plans are closed or frozen, an emphasis on greater allocations to fixed income has become the norm. Ten years ago, the average allocation to domestic fixed income of corporate DB plans among the top 200 was 25.7%; it has grown significantly. But in 2017 that growth stalled halted among corporate DB plans in the top 200, as the average asset mix to domestic fixed income held steady at 38.8% as of Sept. 30. Some plans are emphasizing efficiency rather than increasing their overall allocations to fixed income, Willis Towers Watson's Mr. Delaney said. "I think what we see more from our client base (is that) there's a focus on a kind of capital efficiency," Mr. Delaney said. Some clients might simply increase the duration of their fixed-income allocation, without "having to add more dollars to it," such as splitting their fixed-income allocation into half long government bonds and half in Treasury STRIPS. The ranking of the 10 largest retirement plans remained unchanged the past two years. The Thrift Savings Plan continued its hold on the No. 1 spot where it has been since 2009 when it displaced longtime leader CalPERS. The Sacramento-based California fund ranked second with $336.68 billion, a gain of 9.8%. Rounding out the top five were the California State Teachers' Retirement System, West Sacramento, up 11.5% to $216.19 billion; New York State Common Retirement Fund, Albany, up 9.1% to $201.26 billion; and the New York City Retirement Systems, at $189.79 billion, up 10.6% from the previous year. Internally managed assets increased 10.4% to $1.205 trillion.